At 22, the young loyalist David Hamilton was locked into a powerful cycle of paramilitary violence from which release seemed unthinkable. He would know first-hand what - and often who - was behind that breaking news item: his own barrister told David he was lucky to get only 11 years. Hamilton shows how fraught with danger quitting a terrorist group can be. Yet, even in that dark place, God was waiting for David, whose story details his journey into new life. Turning his life around, Hamilton is now an ordained minister who pastors a growing independent congregation outside Manchester. Since prison, he has also been involved with prison evangelism and drug rehabilitation programmes throughout the UK and Europe. This updated edition is now illustrated with black and white photographs. A Cause Worth Living For by David Hamilton was published by Highland Books in February 2008 and is our 8679th best seller. 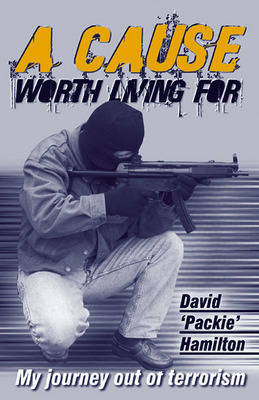 The ISBN for A Cause Worth Living For is 9781897913796. I found the beginning of this book hard reading. Not because it held no interest for me, but because it brought back vivid memories of news items of ‘The Troubles’. So much blood shed and misery. David Hamilton tells the inside story of these times from a Protestant perspective, and his participation in the violence and terror. That is hard reading. Then.....! He becomes a Christian. Not a nominal one to gain favours in prison, but one with a close relationship with Jesus Christ that enables him to stand up before his fellow prisoners, to do the unthinkable and stop a riot in the prison at considerable risk of his life, and to gain the respect of prisoners and officers alike – or most of them. As well as his personal story the book includes the story of Sharon who is now his wife. David is now a well loved Evangelist, living out his faith world-wide. Truly inspiring. Got a question? No problem! Just click here to ask us about A Cause Worth Living For.